"I feel more like myself again." You've noticed changes in your older kitty, but not for the better. He's wandering around the house aimlessly, meowing a lot. He isn't "himself" anymore, sometimes acting like he doesn't know you, and other people and pets in the household. 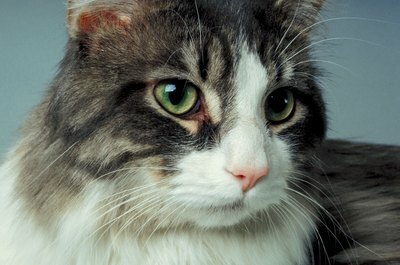 Cats can suffer from senility, and medication can help. Cognitive dysfunction is the proper veterinary term for feline senility and dementia. According to a study cited by Ohio State University College of Veterinary Medicine, approximately 28 percent of cats between the ages 11 and 14 suffered some aspect of cognitive dysfunction, increasing to 50 percent for cats over the age of 15. Similar to Alzheimer's disease in humans, feline cognitive dysfunction results in disorientation, changes in activity levels, inappropriate elimination, sleep cycle changes and behavioral changes. The latter include little interest in interaction with human or animal household members, or sudden fearful or clingy behavior. Before diagnosing your cat with cognitive dysfunction, your vet must perform tests to make sure a disease or tumor isn't responsible for your cat's behavior. Selegiline hydrochloride, marketed under the brand-name Anipryl, or L-Deprenyl, is approved to treat cognitive dysfunction in canines only by the U.S. Food and Drug Administration. However, veterinarians can prescribe it "off-label" for feline patients with the same condition. It's available in various tablet sizes, with the smallest one appropriate for cats. Instead of Anipryl, your vet might prescribe antidepressants that increase the amount of serotonin in your cat's brain. If your cat suffers from other common geriatric feline conditions, such as high blood pressure or hyperthyroidism, his brain might not receive an adequate amount of oxygen. Your vet might prescribe medications that increase that blood flow. In addition to medication, some behavioral therapy and environmental changes could help your old guy. Behavioral therapy for an old cat can consist of spending more time playing with him and getting him to exercise. You might make changes in your house to accommodate an old feline's needs better, such as providing ramps so he can access his favorite windowsills or chairs, or even get up the stairs. If he's experiencing soiling issues, providing an extra couple of litter boxes might solve some of the problem. While relatively few medications are available to treat feline senility, your vet might recommend over-the-counter supplements to enhance your cat's cognitive abilities, or a diet containing certain additives. These might include vitamin E and C, beta-carotene, L-carnitine, fish oils or other oils containing omega-3s, and various antioxidants. Dietary supplements and veterinary diets designed especially for geriatric pets are available. Don't give your old cat any supplements without consulting your vet. Always consult an experienced veterinarian regarding the health and treatment of your pet.